From Disney Studios into a scientific lab: one idea that travelled far! In its narrow definition, a storyboard is a visual outline in the form of illustrations, photos or images displayed in a linear sequence for the purpose of designing a motion picture or an animation, and was initially developed by Disney Animation Studios. This type of storyboard is useful if you plan to produce a short movie or animation for example, and is covered in the article on storyboarding for animations. An excerpt of a storyboard for a (imaginary) scientific animation. The sequence of images helps visualize the intended content of the planned animation and suggests some of the technical solutions for its production. A broader definition of a storyboard refers to a visual outline, a flowchart in a way, which attempts to visualize a process showing all necessary potential steps time- and sequence wise in order to achieve a desired outcome or solve a problem. An example of a storyboard as a visual tool for project design: yellow papers indicate main tasks to be accomplished, other indicate questions, comments, problems and possible workarounds. Digital version of the same storyboard would involve, for example, slide-oriented software. it is in particular beneficial for larger or interdisciplinary teams where many collaborators need to produce a consistent story. A storyboard accessible to all should clearly show what their contribution is, where it fits in the story and when it should be done. A great example of storyboarding in a scientific context is starting out a future publication draft or a grant application not by writing paragraph headlines but by outlining the content of figures and their legends. Once the main figure drafts are there and tell a consistent story, the accompanying text is fairly easy to write. The storyboarding of a scientific paper before actual writing is a great way to save on time and energy invested in every communication. How to storyboard? It all depends on your personal preferences and habits but one traditional approach is to grab post-it notes (or similarly sized sheets of paper) and find a place where they can be attached (wall, board, window…), ideally for a prolonged period of time. Each post-it will contain only one idea, comment, task, image… Scribble your main goal and what your current ideas are. As you brainstorm, add smaller and bigger actions that can bring you to your goal, draw possible figures or mark what data plots will be necessary. Note down any ideas, questions and possible obstacles for each step. 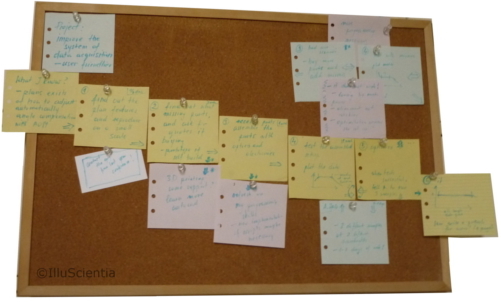 Try to arrange the post-its in a way so that you have a story timeline going from your current situation to what you want to achieve. Feel free to rearrange, add and remove elements. Once you have your main outline, invite colleagues to look at it with you and adjust your storyboard depending on their feedback. As your storyboard develops organically, keep track of changes by, for example, photographing it periodically and saving the images for later reviews if necessary. If you prefer digital, slide-oriented software has everything you need. Each slide is one post-it containing one idea / comment / task / question / image. Once you have your initial storyboard, save it and don’t overwrite. Create a copy with a new date when you make your updates. The advantage is that a slide presentation can be easily shared with far away collaborators for feedback. Whichever way you go and whatever your unique way of storyboarding is, the important part is to look at it periodically to see how you progress, update it and keep clear track of where you started out and what happened so far. Storyboarding for research: good article on the topic with a very detailed discussion of the tool especially in context of PhD thesis. This post is partially based on this article.